BUENOS AIRES, Mar 14 2012 (IPS) - Researchers in Argentina have isolated a sunflower gene and implanted it into corn, wheat and soybean seeds to make them more resistant to drought and soil salinity, problems increasingly faced by this South American agricultural powerhouse as a result of global warming. The discovery was made by a team of researchers led by molecular biologist Raquel Chan of the Agrobiotechnology Institute of the Littoral, created by the National Scientific and Technical Research Council (CONICET) and the public National University of the Littoral, in the northeastern Argentine province of Santa Fe. The researchers isolated one of the 50,000 genes that make up the structure of the sunflower, known as HAHB4, which helps it to endure water shortages. They introduced the gene into wheat, corn and soybean species, then carried out three years of field testing in different regions of the country with varying climates and soils. Chan pointed out that the genetic trait introduced in the laboratory can be combined with others, such as the resistance to herbicides already programmed into numerous genetically modified crops. There are other benefits as well. “Not only are the improved plants drought-resistant and salt-resistant, but their productivity is significantly increased,” which is the most novel feature of the discovery, Chan told Tierramérica. Yields are between 15 and 100 percent higher, depending on the quality of the crop, the region where it is planted and the climatic conditions. In no cases did yields decrease. Although there are other examples in the scientific literature of plant species that are improved to better tolerate water stress, there have been no drought-resistant seeds on the market up until now, said Chan. This is because the test results published by scientific institutions reveal that other drought-resistant plant varieties provide smaller yields when rainfall occurs. They are only productive when there is a shortage or lack of water, explained Chan. HAHB4, patented on behalf of the university and CONICET, was presented in late February, and its use and exploitation have been licensed for 20 years to the Argentine company Bioceres, which is co-owned by more than 230 agricultural producers. Bioceres formed a partnership with the U.S. company Arcadia Biosciences to create Verdeca, the brand under which the new seeds will be sold on the international market. Before they are released on the market, however, the seeds must still undergo a series of tests to determine their effects on the environment and nutritional value, as well as their levels of toxicity. This process will take between two and three years. HAHB4 is an important discovery because it will help the agricultural sector in Argentina confront some of the most detrimental impacts of climate change, commented Graciela Magrin, a leading specialist in agriculture and climate change from the Climate and Water Institute. As a result of global warming, experts predict “an increase in the intensity and frequency of extreme weather events like droughts,” Magrin told Tierramérica. The institute where she works forms part of the National Agricultural Technology Institute (INTA), a government agency that studies the impact of climate conditions on agricultural production and means of adaptation. Climate scenarios for Argentina foresee periods of heavy precipitation concentrated in short periods of time, and longer lapses of water shortages, said Magrin. The lack of rain during this Southern hemisphere summer, now drawing to an end, heavily impacted the cereals harvest, which was expected to total some 111 million tons, but will likely not reach 100 million tons. Losses were especially marked in corn production. The 2008-2009 drought, the most severe in 100 years, led agricultural production to shrink by 37 percent. Natural climate variability and extreme events – shortages or excesses of water, frosts, severe storms, hail – have been observed with greater frequency and intensity in recent years, according to INTA studies. In addition, there are recurring periods of insufficient or excess rainfall associated with the cold phases (La Niña) and warm phases (El Niño) of the Southern Oscillation, a global climate phenomenon marked by changes in Pacific Ocean surface temperatures and air pressure. This is why the experts at INTA recommend crop management strategies that address these challenges and the development of more resilient species and varieties. Magrin noted that when water becomes more scarce, the salinity of soils can increase, which makes the salt-resistant quality of HAHB4 especially welcome. In fact, 75 percent of Argentina’s territory is drylands, with arid, semi-arid or dry sub-humid soils that are more prone to degradation and, eventually, desertification. 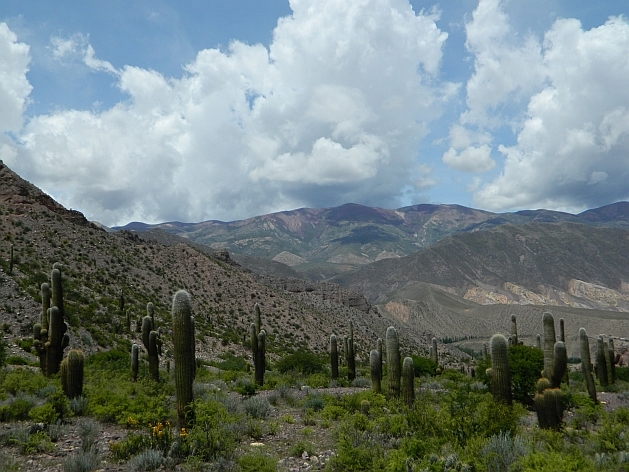 INTA warns of growing desertification in the southern region of Patagonia and serious threats to the southwest area of the western province of Buenos Aires. But drylands are not barren. Half of the country’s crops are produced in these ecosystems, according to the Land Degradation Assessment in Drylands (LADA) study conducted in Argentina and published in late 2011. Nevertheless, careful management is needed. Improved seed varieties can help agriculture better adapt to this scenario. Testing in dryland areas in the provinces of Chaco, in northeast Argentina, and San Luis, in the midwest, resulted in good yields, said Chan. Environmental organisations are not as enthusiastic about these genetically modified seeds. The Argentine branch of Greenpeace is worried that they could fuel a new advance by agroindustry on the country’s forests. Argentina has already lost 70 percent of its original forest cover. “Unless a policy is adopted to completely prohibit forest clearing, these transgenic seeds could mean the end of the last native forests,” Hernán Giardini, coordinator of the Greenpeace Argentina forests campaign, warns in a press release. For the leader of the research team that developed the seeds, protection of the environment is an admirable pursuit, but it must be combined with the increase in food production needed in the world today. “We are molecular biologists and our challenge is to produce more on fewer hectares of land,” said Chan. “It is not up to us to decide how far the planting of these crops should expand. That is up to the government,” she added. * This article is one of a series supported by the Climate and Development Knowledge Network. It was originally published by Latin American newspapers that are part of the Tierramérica network. Tierramérica is a specialised news service produced by IPS with the backing of the United Nations Development Programme, United Nations Environment Programme and the World Bank.